You may recall we did some fiddling around with the game at GDC 2018, but Team Gotham’s Solo has set sail into release. While the game does look like The Legend of Zelda: The Wind Waker, it plays nothing like that. In fact, truth be told, it feels like a game a therapist might recommend, possibly even build if they were skilled enough. That’s both a compliment and a critique though. Solo is a story about love. It’s primarily meant for those who don’t really have anyone to talk to about this (from isolated LBGTQ people to stereotypical males taught it hold it in, especially in conservative circles). 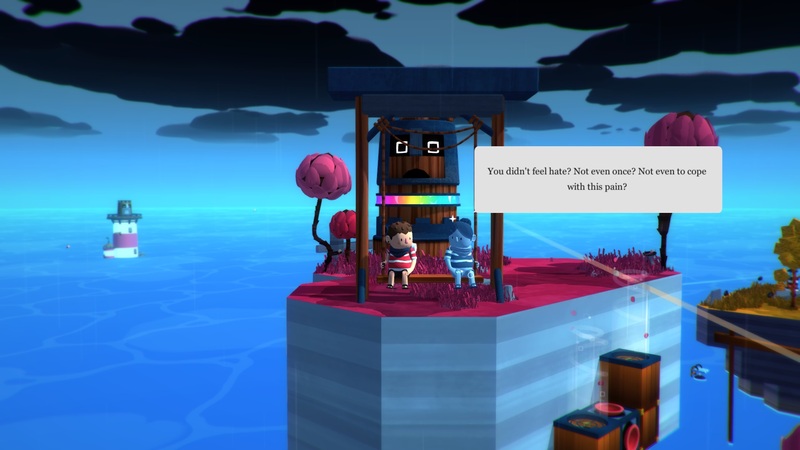 As players solve box-based puzzles while moving from island to island, the game asks them questions about a specific love interest the player inserts into the game. It’s incredibly flexible, not just in gender, but giving you options from an ideal love interest to the one that got away. While the player is given choices on how to respond, for the most part, the player’s love interest will pop in and ask hypothetical questions, without really giving any answers. Journals strewn throughout the game offer further insight. While most box puzzles are about the core mission (activating lighthouses to awake the totem you need to speak to), others are about helping separated animal lovers reunite, which feels like the most normal gameplay you experience. Although the game allows you to play music to change the environment ala-Windwaker (or Zelda in general from at least Ocarina of Time), take pictures/selfies that actually go to Twitter, or just sit on a bench, mostly what you’re doing is moving boxes. And that falls flat. It isn’t that the puzzles are bad. Far from it! They’re quite intuitive, at least for a gamer. The issue is that there’s a disconnect between gameplay and goal. Moving boxes in this context doesn’t feel like it helps the player learn about love, just (perhaps) general patience. It’s like a dating sim that only lets you continue dialogues if you beat a Tetris clone. Compare that with Undertale, in which the player either kills to become a feared murderer or attempts to help those attacking them through conversation while under attack– the pacifist route. The game’s action aligns with the story’s meaning. Had Solo perhaps emphasized the sense of working with your partner (as it does a few times) or winning them over by addressing their needs first (which Solo lacks), the therapeutic story may have held more weight. This isn’t to say the story is unemotional or bad. In fact, I took frequent breaks, not just because the puzzles sometimes bored me, but because as someone who has been in therapy, it reminded me of therapy. There are moments where you know the question that’s coming based on the context, and you don’t want to answer it. It’s physically painful, and I can see how this game could be useful to someone who can’t bring themselves to have this conversation with a fellow human being. The concept behind Solo is solid, as was the tone. My initial concern was that a team of all male gamers wouldn’t be diverse enough to properly address the topic. Team Gotham did their homework and consulted outsiders, and if I didn’t know any of this, I would have thought the developer had a very diverse group working on the game. The concept is simple enough, but as someone who’s made my own story-based RPG, I know branching options can be tough, and applaud the guys for sticking with it in such a complicated and sensitive topic we often don’t see in games. While I was given a review copy of Solo, it’s good enough that I’ve been tempted to send a copy of it to a few people I know who could use it. The only thing holding me back is the thought that the basic gameplay may not be gripping enough to motivate them to continue. Unless someone is a big puzzle fan, it’s hard to stay motivated through the puzzles knowing a really difficult conversation is put on hold simply because you need to move some boxes.